The Brain-Behaviour Research Group is a collaboration of researchers from various backgrounds, who share an interest in understanding the links between overt and covert behaviour, brain processes and 'mental' disorders. Although several of the current research projects are concerned with basic biomedical issues and procedures, the overwhelming focus is upon the translation of the outcomes of these processes to clinical applications, particularly in mental health settings. Professor Chris Sharpley (UNE): Depression and anxiety as functional behavioural responses to overwhelming environmental stressors; Subtypes of Depression; Anxiety & depression among children with an ASD and prostate cancer patients. Professor Vicki Bitsika (UNE, Bond Uni): Autism Spectrum Disorders; Anxiety and depression; Psycho-Oncology; Functional Behavioural Analysis. Professor John Sweeney (UNE, Uni Texas Southwestern): Autism; Family studies of psychotic disorders and autism; Neurocognitive abnormalities in schizophrenia, mood disorders and autism. Professor David Christie (GenesisCare Qld, UNE): Anxiety and Depression in Prostate Cancer patients. Dr Adam Hamlin (UNE): Preclinical studies of depression and anxiety. Dr Linda Agnew (UNE): Bi-directional communication between immune and nervous systems and their role in depression. Dr Nicholas Andronicos (UNE): Proteomic and genomic analysis of depression. Dr Peter Wilson (UNE) (Adjunct): Modulators of neurotransmitters; anatomy and physiology of memory; parahippocampal cortex function. Dr Emmanuel Jesulola (UNE): Understanding the neurobiology of depression and the use of neuroimaging in the investigation and treatment of mental health disorders. Dr Mary McMillan (UNE): Genetic and biological markers of mental health disorders. Dr Phillip Fourie (UNE): Patient-centred assessment and treatment of anxiety disorder. 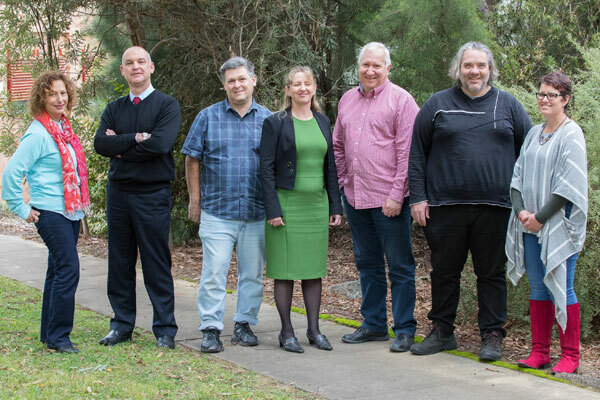 BBRG researchers have partnered with the NSW Department of Family and Community Services to run an IT Club out of the University of New England. The ASD-IT Club is helping local children and teenagers with Autism Spectrum Disorder make positive changes to their levels of anxiety, social interaction and the development of IT skills. Each session runs over a six-week period, and researchers are seeing substantial improvements in the social communication and interaction skills of the participants. Many children with Autism Spectrum Disorder (ASD) also suffer from anxiety to such an extent that they are unable to function well at school or in social situations. One of the aspects of their environment that these children find to be most distressing is an overload of sensory stimuli – sights, sounds, smells and touch. However, little is known about how their brains deal with this overload. In this research we work with children from the community who have been diagnosed with ASD. The research involves measuring the brain activity of these children while resting, and when exposed to sensory stimulation conditions, to better understand how the brain responds in different situations. The project aims to form a model that can be used to restructure classrooms, so that children with ASD can progress more successfully at school. Homelessness is a major social problem in many nations, and Australia is no exception. We are conducting research with Homes North Community Housing, a local housing provider, to measure the neurobiological and psychological impacts of homelessness. This research will help us to understand the severity of mental health problems among homeless people, in particular the effects of elevated anxiety and depression. Participants in this study are individuals living in social housing in Armidale, Glen Innes, Gunnedah, Inverell, Moree and Tamworth. The study will measure the changes that occur to homeless people when they are housed, and will also trial an intervention aimed at assisting previously-homeless people develop more effective social and employment skills. For an up to date publications list please see the ResearchGate or GoogleScholar accounts of the individual researchers , listed above under Memberships and Research Interests.